Manuel Antonio Noriega Moreno (11 February 1938 – 29 May 2017) was a Panamanian politician and general. Noriega went to high school and had a career in the army. He was the de facto ruler of Panama between 12 August 1983 and 20 December 1989. In 1992, a United States court convicted him of drug trafficking, racketeering, and money laundering. 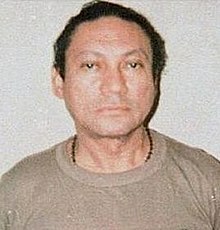 Noriega served a prison sentence in the US, which ended in 2007. He was then extradited to France, where he served another sentence. A conditional release was given to him on September 23, 2011. Noriega was sent to Panama to serve 20 years. He arrived in Panama on December 11, 2011. Noriega died at a medical center in Panama City on 29 May 2017 from complications of brain surgery at the age of 83. ↑ Boyd Marciacq, Carmen. "29, 2007&idnews=33933 Noriega: el dictador." El Siglo. Retrieved on January 8, 2010. ↑ Serrill, Michael S. (January 24, 2001). "Panama Noriega's Money Machine". Time. http://www.time.com/time/magazine/article/0,9171,1101880222-148712,00.html. ↑ "Extradition fight halts former Panamanian leader Manuel Noriega's release from US prison". International Herald Tribune. Associated Press. September 9, 2007. ↑ Serrill, Michael S. (December 11, 2011). "Manuel Noriega extraditado a Panamá desde Francia". Impre. http://www.impre.com/la-gente-dice/viewArticle.action?articleId=281474978913008. ↑ "Gen. Manuel Noriega, the former Panamanian dictator, has died at the age of 83". The Washington Post. May 30, 2017. Retrieved May 30, 2017. This page was last changed on 5 February 2018, at 21:26.